Trillium grandiflorum, aka, white trillium, great white trillium, white wake-robin, grows from Alabama and Georgia in the eastern US to Ontario, Quebec and Nova Scotia in Canada. It is quite abundant in here in North Georgia, South Carolina and Western North Carolina. 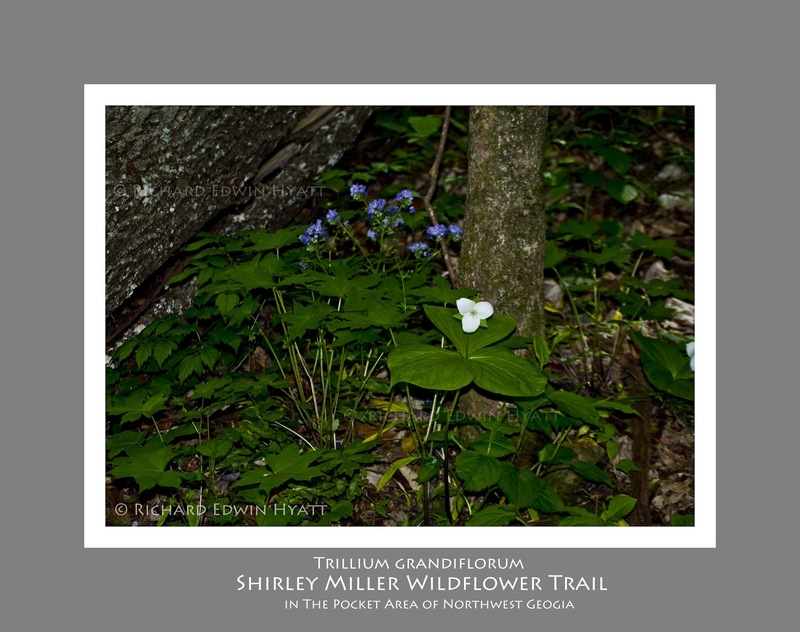 I photographed this trillium at the Shirley Miller Wildflower Train in North West Georgia. One thing I noticed about this picture is that the Antlers are nearly white. I am not sure if that is because I used a strobe to shoot the picture or if it is a normal color. Usually the antlers are yellow in most photos I have seen. I generally try to use existing light when shooting pictures. 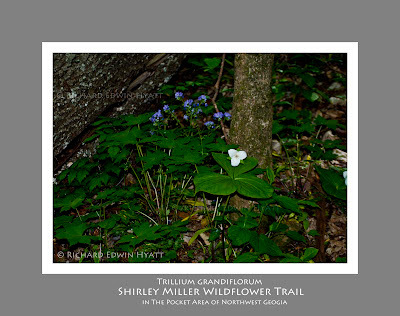 When photographing trillium and shade loving wildflowers they are often found in the dark area of the woods making lighting adjustment necessary to get the shot in a good light. Here, I used the strobe in on my camera. I can tell by the shadows under the leaves. I think this one worked pretty good. Still, those shadows can be a problem in some photos. Using the strobe allowed me to shoot at ISO 100, f5.6, and at 125th of a second. Because I used the strobe I was able to hand hold the camera. It is likely (can't remember for sure) this flower was in a location where I could not use a tripod so, the shot needed to be hand held. In the event a strobe does not give the desired photo you can up the ISO (film or digital capture speed), use a wider aperture (f stop) or extend the time the lens is open (shutter speed). You can bring along a flexible reflector in order to put light from the sun on the photo which even gives a different affect. Using a combination of any of these, as well as, your editing software can improve lighting dramatically. These camera and accessory setting can help greatly if there is a slight breeze or if it is quite windy. Faster ISO, shutter speed and strobe lighting all can greatly reduce the movement in your photo. Camera movement also can, and will, cause blurring of your photo so, it is always best to use a tripod when filming wildflowers. For sure, in sensitive wildflower beds, the subject may be too far away from the camera, to use a tripod. In which case you may use a telephoto lens with your tripod to reduce camera movement. 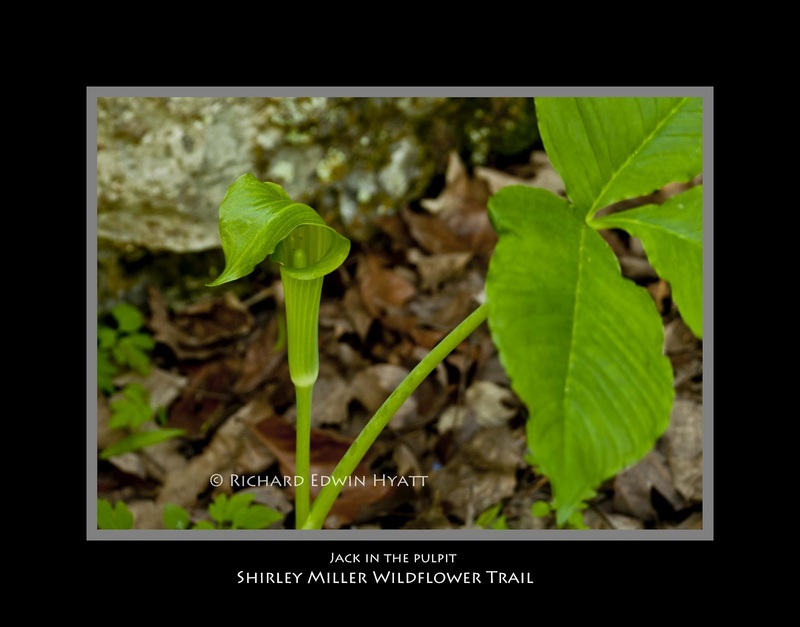 I hope these tips are helpful in all your wildflower photography.